To survive two frigid nights, 17-year-old Nicholas Joy, a fan of survivalist television shows, built a snow cave. For water, he dipped into the icy Carrabassett Stream. For food, there was no option: he went without. Meanwhile, rescuers were frantically searching for the Medford teen, who became separated Sunday from his father on the foggy slopes of Sugarloaf Mountain Resort in Maine. Searchers knew they were racing against the clock. “All we could do was hope and pray,” said Diane DiGirolamo, Joy’s aunt. Now the family is celebrating. On Tuesday, the relatively healthy teen walked out of the woods, and was greeted by a rescue searcher. “We’re just ecstatic,” said his aunt. The news also brought tears of happiness to family members gathered at a chapel at the resort, an official said. His aunt said his first request for food was a hamburger. 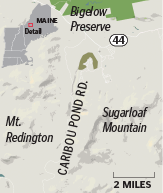 Joy appeared at 9 a.m. Tuesday on Caribou Pond Road, a couple of miles west of the resort, and found Joseph Paul, 44, an off-duty fire captain from Warwick, Mass., who was searching the area on his snowmobile. “He said, ‘I’m glad to see somebody,’ ” Paul said in a phone interview. Joy had been skiing with his father, Robert, at Sugarloaf Sunday morning and was last seen near the Timberline trail on the mountain’s west side around 1 p.m., when he skied off the trail network. Authorities said Tuesday that Joy built the snow cave for shelter and drank water from the Carrabassett Stream, but had no food. Nearly 100 people from several agencies and private groups — including the resort’s ski patrol, US Border Patrol, and Maine Forest Service — had searched for the teen, the Maine Department of Inland Fisheries and Wildlife said in a statement. Joy’s rescue began when he heard snowmobiles in the woods on Monday, and then walked toward the direction of the noise on Tuesday. He also followed snowshoe tracks left by searchers, the statement said. “Actually, he was in pretty good spirits, considering [having spent] that long in the woods by yourself,” Paul said. Doug Rafferty, a spokesman for inland fisheries and wildlife, said Joy was staying overnight Tuesday at Franklin Memorial Hospital in Farmington, Maine, but was doing well. A hospital spokeswoman said Joy was in stable condition on Tuesday. He said rescuers knew on Tuesday that time was running out. Neither Joy nor his parents, Robert and Donna, could be reached for comment. In a statement, his parents expressed gratitude for their son’s safe return. Outside Medford High School, where Joy is a senior, Matheus Anastacio, 18, said he was surprised to learn of his friend’s survival skills. School officials said a message alerting students to the rescue was played on the intercom when the news broke. Joyce The Voice, a substitute teacher, said she heard the announcement in a classroom. “It was such a relief — we were all on edge, to say the least,” she said, adding that she knew Joy as a quiet kid. “I knew he was street smart, like a lot of Medford kids are, and I hoped he had the survival skills he needed,” she said. John Diller, general manager of Sugarloaf, said he was assisting the search on Tuesday when he heard that Joy had been found safe. He said he later embraced Joy’s relatives in the chapel soon after they heard the news. “It was a very teary, huggy kind of thing for the next 10 minutes,” Diller said. Diller commended Joy for being able to survive two nights in the woods as temperatures dipped into the 20s. He said that he has not seen a similar turn of events in his roughly 14 years as general manager.